The thousands liberal-fascist march in Boston, whose participants lynched a few supporters of freedom of speech, shows why they try to compare Trump to Hitler and get rid of him, as of the French president de Gaulle, who was morally suppressed by a riot in Paris in the spring of 1968 and gave up his power the next year. 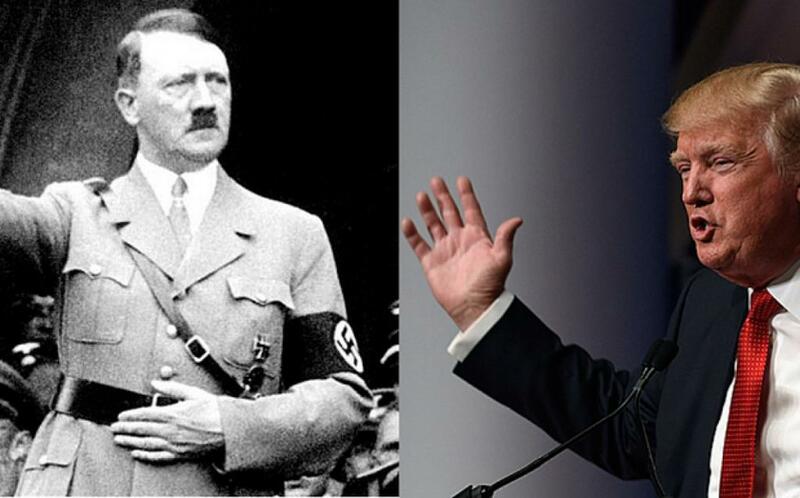 US President Donald Trump is compared to Hitler persistently and stubbornly. There is a "racist", the head of "white supremacists," "the second president of the Confederate States of America," the leader of the Ku Klux Klan, the "new Hitler" in the White House. That is what the mainstream media and social networks are speaking about. They use numerous caricatures on Trump wearing Ku Klux Klan caps and Nazi attributes. Despite the absence of any evidence to accuse the president, participants of numerous protest rallies, which are well paid and organized, keep shouting about it and using the tools of the "orange revolutions" tested throughout the world. The same subject is illustrated in the posters and banners, which are used by the president’s opponents in front of television and photo cameras provided by the structures of "philanthropist" Soros: "Trump is a fascist pig", "Trump-Hitler"
Trump is shown like a dinosaur, a primitive savage alien, who does not match the modern era, an opponent of modern "values", a defender of the interests of the rich, portrayed as a madman. The US Congress has already made a draft resolution on the medical and psychiatric expertise of Trump. He's openly dehumanized: it's a good idea to call on the Internet to kill the president or vandalize Trump's star on the Walk of Fame in Hollywood. They do it quite deliberately in order to mobilize different public movements against the president: left, liberals, national minorities, sexual perverts. And it is highly important to mobilize the blacks who are called to replace the proletariat as the main striking force, especially, since racial claims are much stronger than class ones. Democrats’ constant conversations about racism, their demands to white people to "confess" for their ancestors, cries of white "supremacism" only strengthen the complex of "victims”, which many blacks use as a pretext. This really gives hope for a future "compensation" - welfare assistance and additional benefits by infringing the rights of white people. The rehearsal of the "revolution", which is being prepared against Trump, was held in Boston on Saturday. It was scary. In the capital of the state of Massachusetts, the 30,000-strong demonstration of Tramp's opponents, among whom were people in black who closed their faces, almost lynched a few participants who defended freedom of speech in the rally. It was organized by local libertarians, conservatives, and supporters of Trump. They had to literally run away under the protection of the police from the "anti-Nazis". The police and they were thrown with plastic bottles with urine, provoked to fight. Some of the "anti-fascists" took with them even axes. They were burning the flags of the US and the Confederacy, dragging women, holding these flags in the hands, and threatening to attack the police. They were carrying posters: "Trump is Hitler", "Trump is a fascist pig", "No to Trump, no Ku Klux Klan, no fascism", "No to fascism, no trampism, no fascism", "End with White terrorism "and even" Muslims are welcome ". Since it was all shot on cameras, the CNN channel tried to cover up ungirded leftists, say that those were trying to "achieve peace through violence." How did President Trump react to this disgrace? He only got courage couple days ago to say that "two sides" took part in the clashes in Charlottesville. In Boston, no one was killed because the participants of the march "against hatred" were not allowed to attack a few supporters of freedom of speech by the policemen who took the main blow at themselves. Unfortunately, Trump's sympathies were on the side of the thugs this time: "I want to applaud numerous protesters in Boston for speaking out against bigotry and hate." It is clear that this absurd reaction was not sincere. Apparently, people from Trump's inner circle, probably, even his family persuaded the president this time not to condemn the liberal fascists that are supported by the mainstream media and their numerous critics. And Trump gave up. It worked! So this method will be used in the future. If we do not touch the left and the liberals, and only change the proletariat to blacks and perverts, then everything will resemble the scenario that happened a half century ago when General Charles de Gaulle, who was a much stronger and more deserved president than Trump, was removed from his power in France. The uprising of the leftist students and workers, which was organized by the mondialist circles against the power of the conservative French president in the spring and summer of 1968 in Paris and its environs, did not directly lead to de Gaulle's expulsion from the Elysee Palace. During the uprising, which united laborers and offspring of wealthy families, the president left the capital, not telling anyone where he was going. He flew by helicopter to the headquarters of the French army in Baden-Baden (FRG). But when he made sure of the loyalty of the military, he quickly returned. He changed the policy of constant concessions to the demonstrators to a tough course. He achieved to cease the turmoil quickly but his measures were followed by the slogans "Farewell, de Gaulle," "De Gaulle to the Archive," "We Will Be Cruel," "Neither God nor Mister". The sight of Paris, set on fire by nihilist extremists, frightened France. The Gaullists received a record number of votes in the early parliamentary elections. Their party won a majority in the parliament for the first time. However, the lack of unity at the top and the moral trauma of de Gaulle, who realized that many Frenchmen considered him as an out-of-date figure - too conservative, too authoritarian, after all, too old - led to another president in France the next year. It is clear that they want to use against Trump something similar: comparing him to Hitler, and making him "go", as de Gaulle, as a result of the Orange Revolution. And the chances for this are much greater now than it was in France half a century ago. Opponents of Trump are everywhere in the country. According to surveys, they are over 50% of the US population.They have increased tremendously social network’s influence to organize protests in our days. The financial resources of Soros and Co. are unlimited. Trump’s elite is much weaker than de Gaulle’s. You can say it almost does not exist. The impeachment procedure against him has been technically started. Supporters of the US, which are also a lot, are too passive, the little initiative and unorganized, and conservatives are generally not aggressive by nature. They are loyal at the rallies organized by Trump. Trump’s ex-adviser Steve Bannon calls the cartoon Ku Klux Klan and "neo-Nazis". The collection of clowns," but it does not help. They are not capable of doing anything serious, they can only compromise. And still, they will not let Trump justify that he is not a "racist" or "Hitler". He does not have the same merit in front of the country, as de Gaulle had. In fact, the only force that saves Trump from the leftists, liberals, and perverts is the army and special services that have not received what they want from him yet. Here is the position of the 45th US president today, who declared to drain the corruption Swamp in his country. Trump thought the strong president could do it. He made a mistake.